Please post all bug reports in this thread! Include your username and screenshots where relevant. For general discussion about testing, feel free to start a new thread. ok alpha testers, there's a LOT of known bugs. it hasn't been tested properly on iOS, and you probably won't be able to switch between scenes. 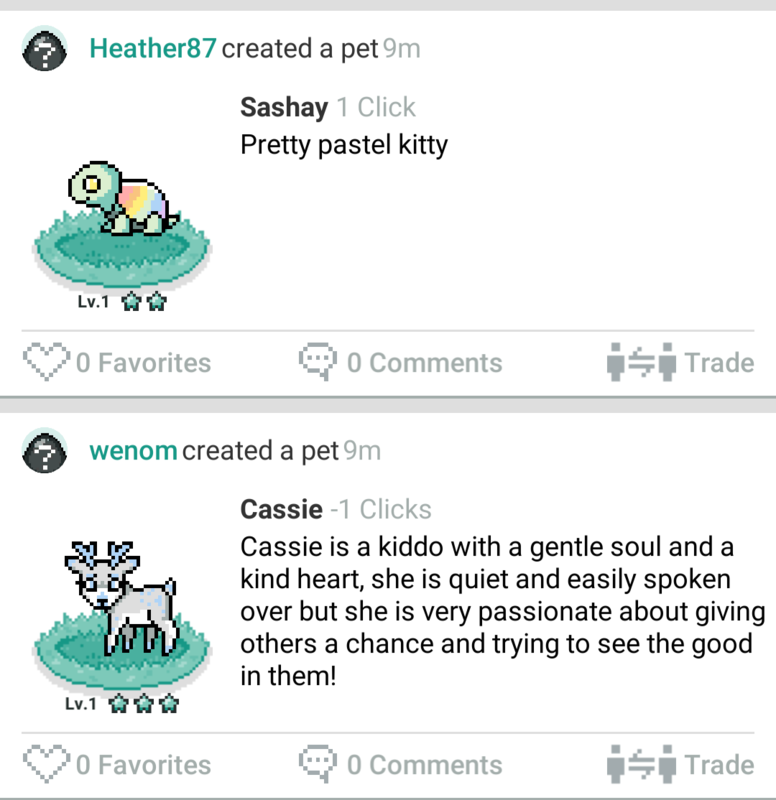 Also published petz don't load on iOS... so you can just keep petz in your drafts (don't hit publish), and just view them from the base select menu. YEAH. we still wanted to let you guys try it though! most of the big bugs we probably already know at this point, just need time to fix. Except for having my published petz hidden, I have also found some issues with the paint bucket tool not working always. Sometimes it works but other times it won’t fill anything in. Stuff I've noticed so far, sounds like most of it is expected ... username is ouroboros, using iPhone 5s iOS, current on updates. Other than that and published pets being unavailable, creating a pet seems to work as expected, with the exception of the paint tools being a little laggy sometimes. And this isn't really a bug, but it's probably not just generalized feedback either, so I'll put it here - I've fatfingered the "back" button quite a few times attempting to hit the "undo" button. Might want to relocate them a bit further apart to avoid that. I've got some general suggestions but I'll leave those in the other thread. So far I'm enjoying the app, it's fun to create the pets! I'm also getting the same "Debug" and then "0" (after a purchase) on the Palettes screen. And the same unloading "123451234512" profile page (although perhaps that is what you meant about not being able to switch between scenes). The entire app seems quite slow (not just the paintbucket) although that could be because my internet in general is slow today thanks to stormy weather. I love all the different bases. They are so stinkin' cute. I don’t have much to add, my experience is the same. For me, the paintbucket seems to either work selectively or not at all. Sometimes it’s slow, sometimes I get absolutely nothing. I’ll keep this updated as more comes up! The bases are adorable and I’m so flippin’ excited for this to go live! (03-23-2018, 11:36 PM)ouroboros Wrote: I've fatfingered the "back" button quite a few times attempting to hit the "undo" button. Might want to relocate them a bit further apart to avoid that. oh interesting! didn't even occur to me that those were close. I'll keep that in mind, maybe move the redo-undo buttons to the other side of the preview icon. thanks for the feedbacks! I'll see if we can update everyone soon. "Your life is an occasion... Rise to it." thanks for your detailed reports and pics! that's very helpful. I'm going to close this board soon, but please do keep posting on the Beta board! I'll move your post over to get it started.